Tropical Coast Retreat offers the best of both worlds, with ocean views and hinterland vistas. We’re just 5 minutes drive to the popular resort town of Kingscliff, its beaches and world class restaurants, 10 minutes drive to Tweed Heads, 15 mins to Coolangatta and Gold Coast Airport and 30 minutes to Byron Bay and 20 mins to the country town of Murwillumbah, Mt Warning Climb. 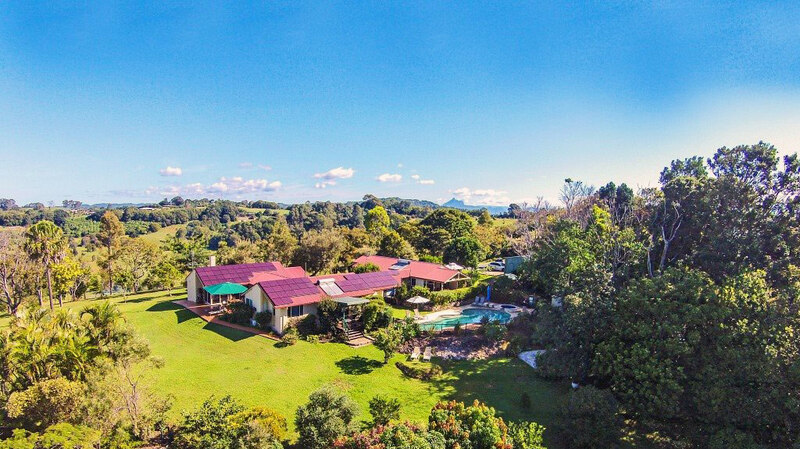 With only two self contained suites, each with a private ensuite spa bath, overlooking the beautiful Tweed Coast or Tweed Valley hinterland, Tropical Coast Retreat offers affordable rates from $150.00 per night. What more could you want for that perfect short drive getaway or hideaway break? Beach AND bush within easy reach! Contact us now to check availability. Imagine starting the day with a dazzling sunrise over the the South Pacific ocean, then enjoying a spectacular sunset, as the daystar slips below the rugged mountain escarpments of the Border Ranges – all by strolling just 10 metres to the east or west of your accommodation! We’re located on 13 hectares (35 acres) which used to be part of a tropical and exotic fruit orchard, and can boast a four hole practice golf course (with the best views! ), Gondwanaland rainforest grove and an exploratory walking track to remnant Ti tree forest with a secluded picnic spot. Our retreat is ideal for driving holidays, a midweek escape, weekend getaway or romantic honeymoon. For our sauna, spa and massage information use the link. Pet friendly accommodation is also possible, check with Veronica or Rick for availability, there is plenty of space for your pet to play. You’ll feel like you’re a million miles from the hustle and bustle, when you get away from the crowds, kick back, relax and de-stress, nestled on this rural property, but all the action, night life, culture, sport and entertainment, are within easy drive. Why not check availability now? ….”best decision we have made this year – from the minute we got out of the car it was perfect – massage was fantastic and the facilities could not be better, thank you heaps, we will be seeing you again”….